Our dentures in our Salem and Newburyport dental offices are precisely crafted from the latest, most durable and attractive materials, are long-lasting, affordable and aesthetically attractive. Dentures are artificial devices created to replace missing teeth; in other words, false teeth. They were first created around 700 BC from animal teeth. In the 1500s, dentures were carved from bone or ivory. Both of these early precursors rotted easily and were not suitable as permanent teeth replacements. The first dentures made from porcelain came from France in the 1770s, were perfected in Britain in the 1800s and, by the 20th century, were made from rubber vulcanite into which individual porcelain teeth were set. Thank goodness for the advancements of modern dentistry! Today, dentures are precisely crafted from the latest, most durable and attractive materials, are long-lasting and very affordable. Conventional dentures are removable. Some types of dentures rely on bonding, clip onto remaining teeth or are assisted by dental implants. Full dentures are categorized by two types, called the mandibular arch and the maxillary arch, depending on whether the denture is expected to replace missing upper teeth or lower teeth. Full dentures are a godsend for individuals who have lost most or all of their teeth, helping patients to chew better, enjoy their food more, speak more clearly and maintain their facial features, since many missing teeth will cause the face to have a ‘caved-in’ appearance that signifies old age. 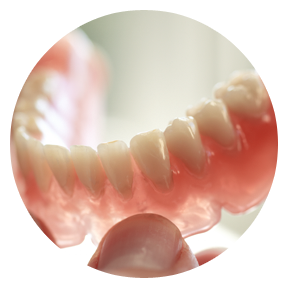 Removable partial dentures are also available for patients missing only some of their teeth. Fixed partial dentures, also called ‘crown and bridge‘, are made from dental crowns that fit on remaining teeth along with dental implants that closely resemble missing teeth and are non-removeable. Are you struggling to speak or eat because of many missing teeth? If you’ve been procrastinating about seeing Dr. Mathew because of the cost of dentures or the time spent in the dentist’s chair, you’ll be happy to know dentures are highly affordable and easy to fit, thanks to modern dentistry. Why not contact Artisan Dentistry in Salem, New Hampshire and Newburyport, Massachusetts today to schedule your free denture consultation? Our dentures are precisely crafted from the latest, most durable and attractive materials, are long-lasting, affordable and aesthetically attractive.